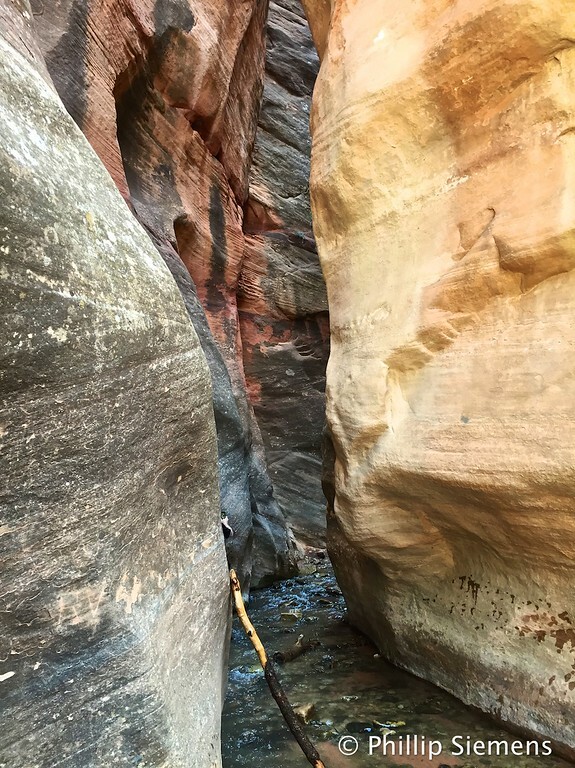 Dan encouraged us to hike the slot canyon of Kanarra Creek. He had done it last year seeking a geocache that turned out to be missing. Besides wanting another crack at the cache, he said it was just a beautiful, unique hike. The trailhead is in Kanarraville, a small town south of Cedar City. The hike is mostly on BLM land that is north of Zion. Mark and Chase wanted to start about 1 pm, giving them some time with the rest of their family at a St. George park. I asked Dan if he wanted to geocache with me on a roundabout back road route to Kanarraville, and of course he said yes. Page Ranch house, built circa 1900 with bricks fired on site. We headed north out of St. George on Highway 18 and turned east on Pinto Road (FR009). This was a well-graded gravel road. We picked up a few caches along this road. 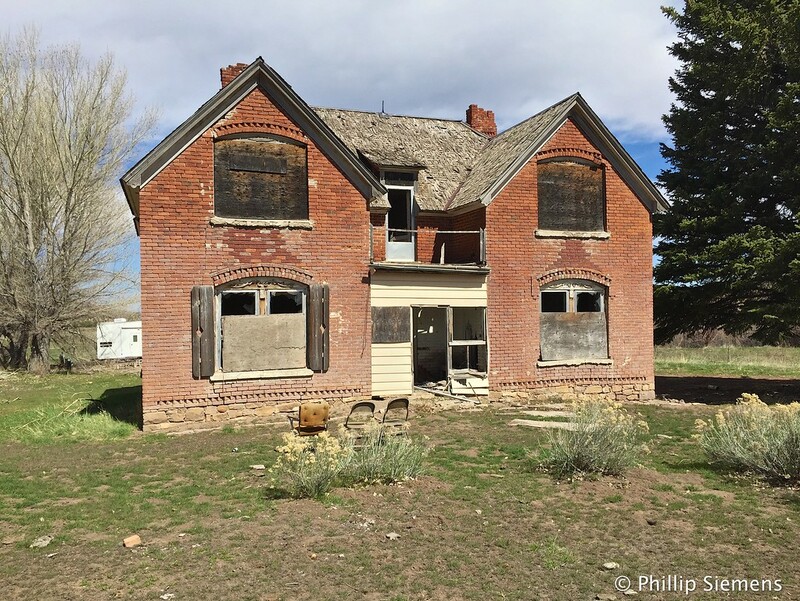 At Page Ranch (a virtual cache and a large brick house built in the early 1900s) we turned onto FR029. This was a much rougher road. After some recent rain a vehicle had driven it while it was still deep mud, resulting in deep ruts. We picked up another couple of caches on this road. As we approached Harmony, we hit a string of challenge caches where I picked up the Utah Fizzy challenge. We didn’t do all the challenge caches for lack of time and even so, Mark had to wait about 10 minutes for us to get to Kanarraville. The first mile or so of the hike follows a dirt road along the creek. Eventually, the trail drops down into the creek, crossing back and forth. We managed all of this without getting our shoes wet, but soon we hit a narrow section where there was no choice but to walk in the water. The water was freezing, but never deeper than about mid-calf. After a bit we came to the first obstacle, a 15 ft. waterfall. We made use of a sturdy make-shift ladder and were quickly on our way. 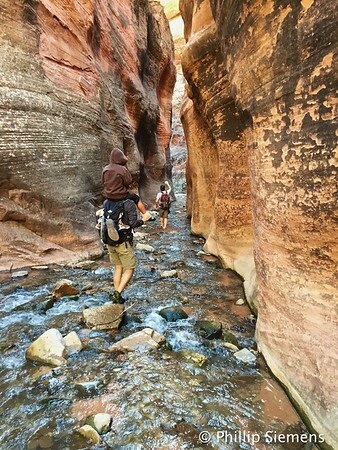 We traversed some more narrows before reaching the upper falls. By the way, Chase was being carried not because he was tired but because he was cold. 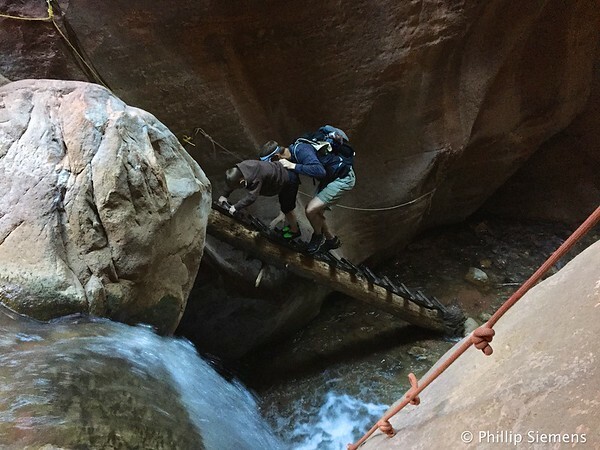 The “ladder” at the upper waterfall was kind of sketchy, a combination of a rickety wooden ladder with missing rungs and a sloping, wet log. Slow and easy does it. We put Chase in a harness and belayed him, but he did fine. There were a lot of people in the lower sections of the canyon, but not too many above the upper waterfall. We found the geocache easily—the replacement was hidden higher up and hopefully above any possible flash-flood. We pressed on up-stream until we realized we were running really late time-wise. 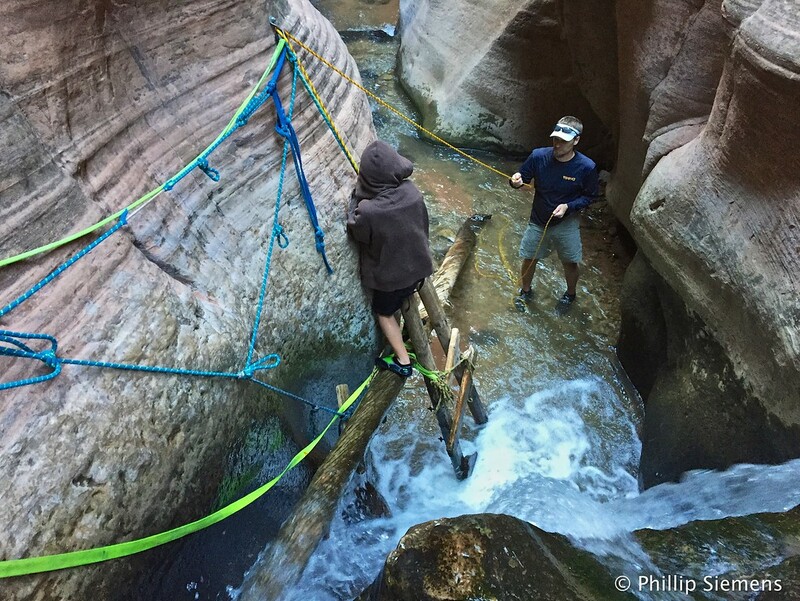 The upper canyon was more woody and wider, but still had high cliff walls. When we returned to the trail-head we realized we were just about the last ones out of the canyon. Dan Siemens liked this on Facebook. Lis Wilson liked this on Facebook. Margie Saravia liked this on Facebook. Love hearing all about this hike and the awesome photos. Lucky Chase to share this with you three!